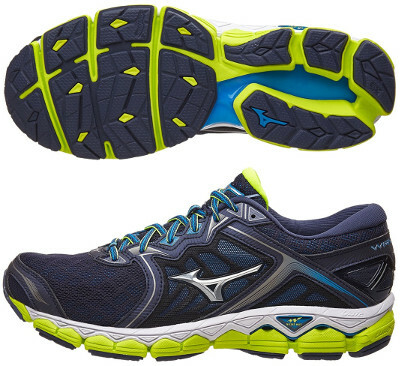 Mizuno Wave Sky are neutral cushioned running shoes. The brand new Mizuno Wave Sky is actually Wave Enigma's successor so premium materials, abundant cushioning and high price tag are expected. It is set one step above successful Wave Ultima 9 within neutral running shoes from the japanese brand. Although we would need to wait for feedback from unbiased (aka independent) testers to check strengths and weaknesses, final word will come from competitive market to see if change of the name will push sales up. Several changes show up compared with Wave Enigma 6 which can be considered as its predecessor. New lighter and softer fabric has replaced the Viscotech mesh, but it is surprising the amount of sewed overlays (when overall trend goes in the opposite direction) particularly the one wrapping the midfoot that surely will provide snug and secure fit but also raises some concerns about ventilation and breathability. Collar area has been redesigned with lower height to better achilles protection in a similar way the popular Asics Gel Kayano 24 does. Midsole in Wave Sky features typical Mizuno premium configuration (just 10 mm drop) with full length innovative CloudWave™ (for improved stability) between U4ic™ (top) and U4icX™ (bottom) featuring maximum cushioning and good response. Outsole is pretty similar looking for more flexilibity with more segmentation and deeper grooves for smoother transition. As usual in any Mizuno running shoes, more robust rubber (X10) is used in more exposed areas to increase durability.